Psychotic State Book Reviews: Lovely Blog Award! 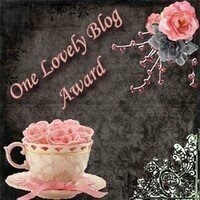 Many thanks to Jessica at A BookLover's Diary for bestowing upon my blog The Lovely Blog Award! Please stop by Jessica's blog to read her thougtful and well-written reviews. Also, congrats to you for getting the awards in the first place. Wow, thanks so much Lori!! I think your blog is quite lovely too, and congrats on your award as well!! I will blog about this on Sunday for my Sunday Salon. How cool! Thank you so much Lori! !